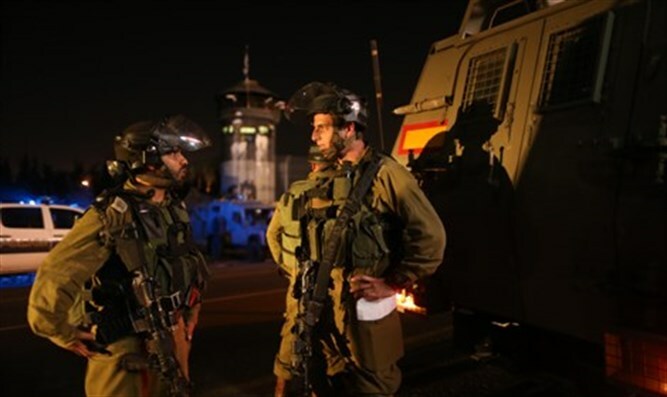 Israeli security forces arrest 6 Hamas terrorists and 16 other terrorists. On Sunday night, IDF, Israel Border Police and the Shin Bet internal security agency arrested 22 wanted terror suspects in Judea and Samaria. Sixteen of the suspects were suspected of involvement in "regular" terror activities, violence against citizens, and the disruption of order, and the other 6 were members of Hamas. Two of the arrests were made in Jenin; and 2 Hamas terrorists were arrested in Wadi Burqin and Rumana. Binyamin Region forces arrested one terrorist in Ein-Um Ashreit, two terrorists in al-Omri, one terrorist in al-Bira, and three terrorists in Anata. Gush Etzion security forces arrested one Hamas terrorist in Surif and Judea security forces arrested four terrorists in the Hevron-area Arab village of Beit Awwa. Efraim-area security forces arrested nine terrorists: three who were members of Hamas, four in the town of Qalqilya, and two in Asla. All of the terrorists were handed over to the relevant authorities.